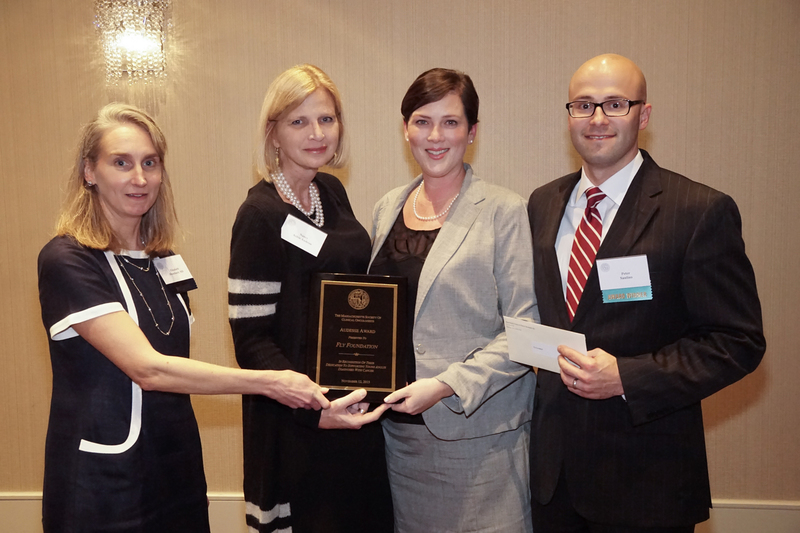 (L-R) On behalf of the Massachusetts Society of Clinical Oncologists, Dr. Elizabeth Blanchard and Nancy Achin Audesse present the 2015 Audesse Award to FLY founders Julia and Peter Saulino. 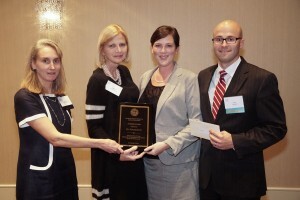 On Thursday, November 12, 2015, The FLY (Financial Lift for Young Adults with Cancer) Foundation was honored by the Massachusetts Society of Clinical Oncologists to receive the 2015 Audesse Award, established in 1993 to recognize outstanding efforts to educate the public about cancer prevention and to enhance and protect the quality of cancer care in Massachusetts. The award was named in honor of Nancy Achin (Sullivan) Audesse, a former Massachusetts State Senator who sponsored the legislation mandating that Massachusetts insurers pay for off-label uses of cancer therapy drugs. The FLY Foundation was founded in 2010 by Julia Saulino and her husband, Peter, during the course of Julia’s treatment for Hodgkin’s Lymphoma at the age of 29. To date, The FLY Foundation has awarded grants totaling more than $200,000 to more than 100 deserving young men, women and families in Rhode Island and Massachusetts. The FLY Foundation enabled some families to avoid worrying about paying their mortgage or monthly rental obligation during three months of critical cancer treatment, allowing the patient to focus on getting well, rather than getting to work to avoid foreclosure or eviction. Other patients benefitted by being assured that mounting co-pays did not negatively impact the lives of their children while s/he underwent cancer treatment. At a point in young adulthood when their recipients had worked hard to establish financial independence, The FLY Foundation helped to allow them to keep their lives and dreams on track in spite of a cancer diagnosis. Their work was recognized through receipt of a Jefferson Award for Public Service in 2014. The FLY Foundation is a registered non-profit organization in the Commonwealth of Massachusetts, providing support to US citizens aged 19-39, who are residing in Massachusetts and Rhode Island and have been diagnosed with cancer. The FLY Foundation’s board of directors is 100% volunteer-based, and its operations have no recurring expenses (salaries, office space, etc. ), so all charitable donations are funneled directly into grants so that donors’ support goes to people who need it most in their community.